Preheat oven to 375°F. Spray shallow baking pan with cooking spray. 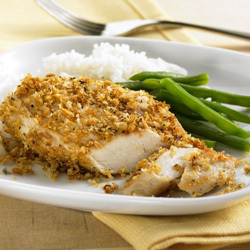 Combine bread crumbs, garlic salt and lemon pepper in recloseable food storage bag. Combine lemon juice and oil in another recloseable food storage bag. Add chicken to bag with lemon juice mixture; toss to coat. Place each breast in bag with crumb mixture; shake to coat. Place coated chicken in single layer in baking pan. Sprinkle any remaining crumbs over chicken, if desired. Bake 20 to 25 minutes or until chicken is no longer pink in centers (165°F).